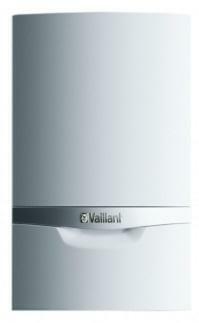 The ecoTEC plus 838 38kW is a combi gas boiler by Vaillant, this boiler is a wall mounted condensing boiler. With it being a high efficiency boiler coming with an efficiency rating of up to 89.3% as well as coming with a high output of 38kW this unit is extremely economical to run with it using a continuous modulation and real combustion control with a multi sensor system, helping to achieve the high efficiency as well as low emissions, helping it to be the economical boiler it is. As well as this this range comes in a number of outputs such as 25, 32, 35 and 38kW helping it to be a perfect unit for those larger homes with high water demand. It comes with an innovative integrated hot water storage device which is located at the back of the boiler. This feature means that it is capable of delivering up to 20 litres of hot water per minute. Giving you instant hot water in just 5 seconds. With it also coming with a wide modulation of up to 1:6 helping to ensure the boiler has a low energy consumption as well as the maximum efficiency with it coming with a flame lift detection system helping to have quieter combustion. This unit comes with many ways in which to make it as efficient as possible such as the built-in-two-stage frost protection that ensures you have the best performance all years round including those frosty winter months when you may need it most. This boiler is ultra quiet whilst in operation with a quiet accreditation mark with it also coming with a step by step wizard helping for a quicker first time right setup and installation as well as being available in an LPG version as well as natural gas. This boiler comes with 5 years warranty to give you the added security that you have a reliable boiler.